My initial effort at making dinner more often, started with a bang. After I wrote the last blog post, I started meal planning and of course, I turned to Pinterest for ideas. I found a recipe I thought looked tasty for Buffalo Chicken Quinoa Salad. It looked great, but I decided I wanted it to be a bit lighter. I don’t want to be eating a pound of quinoa for dinner (not that there’s anything wrong with that, just not my taste). Delicious, and ready in less than 30 minutes! Not to mention it’s super easy clean up, since you only use one pot/skillet. To make life easier, I bought pre-cut and pre-washed shredded carrots and cabbage. So the only chopping I had to do was the green onions and chicken. I was really pleased with this meal. I liked how quick and easy it was, but also tasty. If you wanted to make this spicier, I would definitely add some sriracha for a little added kick. You can also just get the spicy buffalo sauce instead of the traditional buffalo sauce. Now I have a ton of left overs for lunch, but I’m excited for my next dinner creation! Yeah spaghetti squash! This recipe looks delish- and I love one pan meals too! Has anyone ate the leftovers cold or should it be warmed up? I ate the leftovers and just reheated them in the microwave. It tastes alright cold, but I prefer it warm. Fabulous dish! Even better when stuffed in cool lettuce leaf for a wrap….perfect balance of hot and cold! Awesome!! In a lettuce wrap is a wonderful idea!! Definitely worth trying if you like Buffalo wings. Although that wing sauce is pretty darn salty, and that’s coming at it from a foodie perspective, not that of a health nut (though there’s that too!). If I try it again, I think I’ll pack in a bit more carrots and cabbage, and/or cut back on the sauce. I’m going to try adding some celery dices to my leftovers, to further cut the saltiness and augment the Buffalo wings homage. I agree. The sauce is definitely salty! 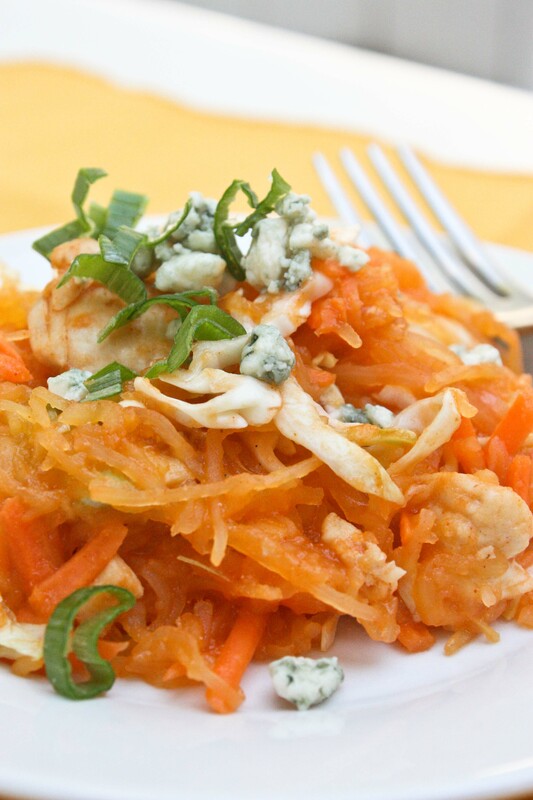 I think your suggestion of adding more cabbage and carrots is a good one. This looks delicious! 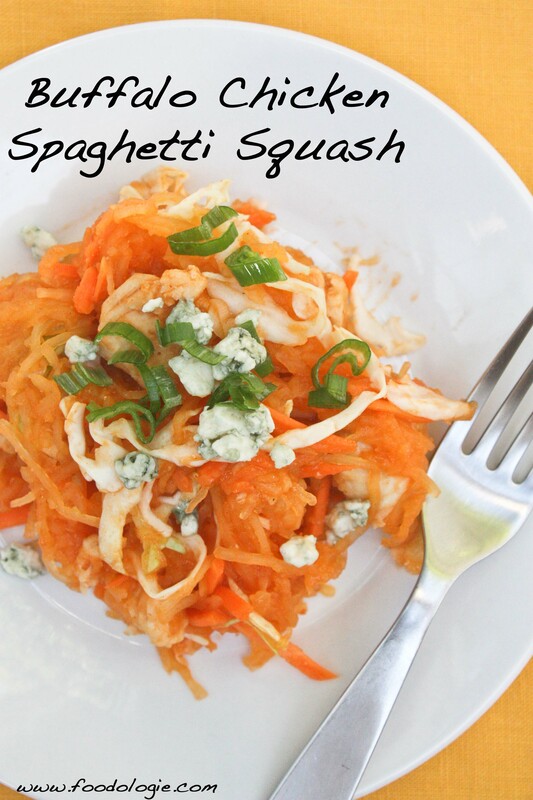 I have been meaning to try spaghetti squash for FOREVER! I love lighter takes on spicy buffalo dishes. I need to remember where to find this when I get the time to actually make it. This sounds delish! I made this and it didnt look anything like the picture. It was mushy. What did I do wrong? Hmm a number of things. Over mixing it will make it soggy. I know mine was soggier the next day when I ate the leftovers. In general, spaghetti squash is a little soggy. If you don’t fluff it with a fork, it sort of clumps together and gets mushy. Hope it didn’t ruin the taste for you! 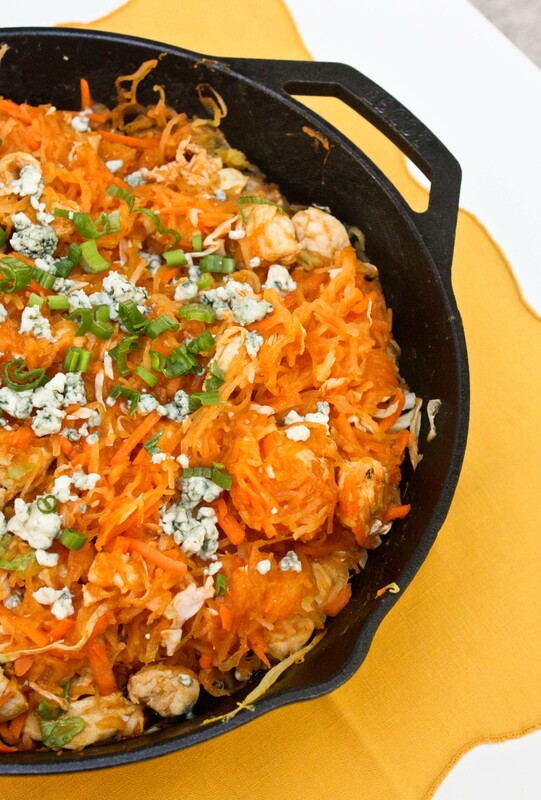 I really wanted to like this because I LOVE hot wings, and I love spaghetti squash. This tasted like cole slaw with hot sauce on it instead of slaw sauce. It was not tasty at all. Husband refused to eat it. Next time I will just make wings and slaw. Sorry to hear you didn’t like it. Can’t win ’em all! This is amazing!!!!!! I never leave comments about foods.. But this was my first time trying spaghetti squash and this meal is wonderful! love the trackbacks / pingbacks section of this website — saved my life when my original copy of a recipe became corrupted and I couldn’t open the file. The carrots and cabbage were throwing me off, so instead I put celery. I also added about a teaspoon of light blue cheese dressing to cut the saltiness. Came out awesome! Although next time I think I will throw the chick in the crock the night before and then shred it instead of adding it in cubes/chunks. Great recipe idea! Actually one of my new favorite meals. I have leftovers from all of the ingredients so I think I’m going to make some up again tonight. Awesome Awesome Awesome. If you love buffalo sauce and chicken (like I DO!) this will be your favorite new dish for sure! I bought a “coleslaw” pack of shredded cabbage and carrots and threw in 2 cups of that. Worked perfectly. It was incredibly easy to make, all in one pot is the key. Thank you for sharing this new recipe!